A tablescape is a careful, purposeful, and artistic way of arranging a table top. It can be based on a season like summer or fall; an occasion, like a wedding; or a theme, like Oscar night. It can also be completely utilitarian. Whatever the basis, when done well, a tablescape is inviting, and brings warmth to a dining space. 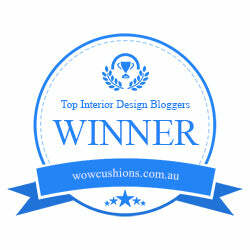 Tablescapes are this weeks’ focus of inspiration. So often, I hear homeowners complain that their dining room tables are a constant dumping ground for all sorts of randomness. But, like a woman in a sleek pair of heels, so is a table that is properly “dressed”. It draws you in - makes you act... differently. It's true. People tend to modify their approach when faced with a table that is adorned. The intentional styling - complete with dinnerware, glassware, centerpieces and eating utensils - is a signal to home dwellers and guests alike that this is not the zone for your purse or wallet, house keys, homework, or the daily mail. Contrary to popular belief, a tablescape does not need to be extravagant to have this type of effect. All around us are great places to spot cool, unique, and totally duplicatable (is that even a word?) tablescapes. Simply take the ideas and modify or pare them down for your space. 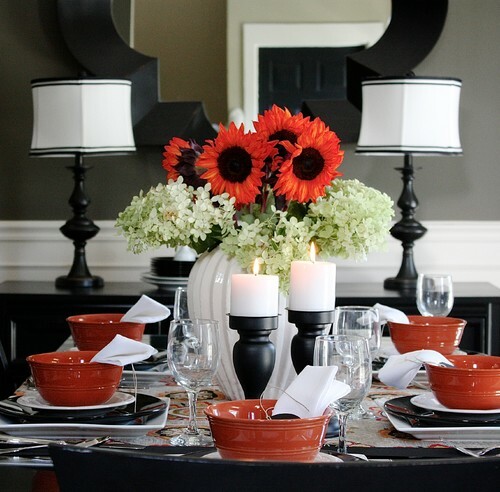 Here are some examples, starting with a fall tablescape. Below is a great example of what I call a utilitarian or functional tablescape. It may be that this homeowner doesn't have the luxury of two separate eating spaces. Still, the area is clearly defined as one for eating while perhaps enjoying the morning paper. No alternative dumping space here! Notice the intentional placement of the stacked bowls and plates. The bouquet of flowers adds a touch of warmth, and the tray is useful for coffee or pastries. If you're planning a fall brunch, the photo below, taken at my local Pottery Barn, is great inspiration. Simply re-create it by scaling back some of the flowers, then add your own foodstuffs. It will look like you worked all day to create this look. Here is a minimalist approach. Notice that it is no less inviting than the other table tops, and is appropriate for the mid-century modern style of the home. Speaking of minimalism. You may have seen the photo below in my instagram feed. It was also taken at my local Pottery Barn store. It's so simple, and yet cozy. 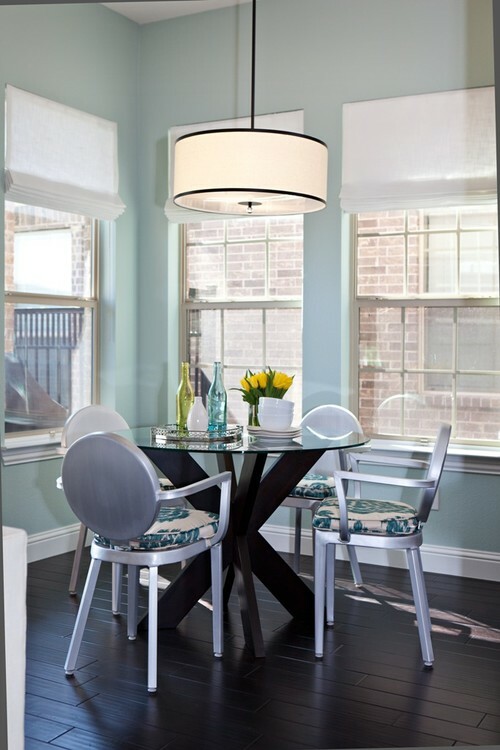 To incorporate it into your space, place it on an elevated base with a table runner underneath. Sprinkle the table with a few more succulents, and add the dinnerware. It's just that simple. Tablescapes are not just places for food. They can serve as a place to welcome guests. They can also be used to create an ambiance, which is why this next photo is my absolute favorite. Va-va-voom y'all! Can you imagine a scaled down version of this on top of a piano, or at a garden party? Yes please! All of these photos were either curated from around the Web, or taken by me at local stores. If they can do it, you can too. So, tell me, where have you found inspiration for your table top?